AWESOME!This is the word most pronounced at the end of the 3rd edition of DESERT RAID. All teams are delighted to have participated in this test, and especially he is having lived with colleagues as incredible as this edition. We found all the teams on Saturday morning at the Port of Marseille to take the ferry Tunisia. The desire to access the details of each stage, (the organization maintains absolute secrecy), and stepping sand are common to all participants. The journey time between laughter, discussions and exchange of information. Sunday arrived promptly to Tunisia. Step procedures and customs make them unusually quickly thanks to the collaboration of the Tunisian authorities, we are waiting and we provide the most all procedures. We descended motorway to Douz, located at the gates of the Desert. In this issue, the Organization provides teams a transport truck vehicles to lighten up. So that, all teams begin to transfer to truck the extra load. The dunes will mark the development of the rally and need to reduce the maximum weight of the car and its center of gravity. Being an amateur test guidance and navigation, there is no established canon preparation, so are practically standard vehicles and monsters that impact them only. In a fun relaxed and friendly atmosphere and above, We held the first briefing of the test. high expectations: all ears positions in the explanations of the Organization, and all eyes on the main opponent to overcome: Joan Lario and imposing Toyota FJ, champion of the previous two editions, once again, It was the favorite to win the rally. Begins the briefing and the Organization gives us the waypoints of the first stage. It is done! Start the fight against the clock to design the best strategy stage, analyzing maps, measuring heights and distances and analyzing every detail to optimize the efficiency of travel. 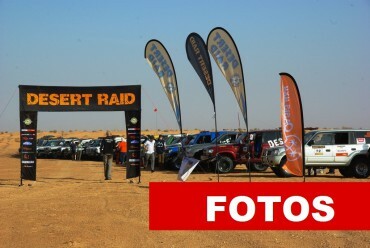 DESERT RAID, true to its slogan "100% sand and adventure", It begins at the gates of the desert, a few hundred meters from the first dunes. Is the first contact and the first jams begin to make a difference, and strategies. Are the first sand dunes of average height, with some very technical sections, that make us work and enjoy all. In Ecuador stage we expect a pleasant surprise: hidden in the sand and among large dunes, We found a large field of desert roses! Ends unequally stage for teams: some go smoothly, others are late with the corresponding penalty and some have to be rescued by the Organization and guided to the camp. In this first stage highlights the Frenchman Benoit Landanger, that con un series of HDJ, It flows from the first minute a very high rate, through all the waypoints, and also solo. A very risky strategy at the end of the stage gives very good results. Joan Lario, second ends, a few points Landanger. Other equipment, as Infernal Team and HDJ 100 Som-Hi, also get very good ratings, it promises a very exciting edition. At night the atmosphere ceases to be competitive and becomes a true celebration: laughing and joking occur late. The hardness of some sections at this stage, forces teams to work hard constantly opening new traces and passages between the dunes, to stroke winch, shovels and plates. The hardness of the stage is offset by the beauty of the sand dunes and the fun of the stage. On arrival at Meta it is fantastic and comes just at sunset, that gives us a dreamlike images. And at night, a Spanish environment: party and laughs until late. French, quite rightly, They are surprised at these times in a competition, but do not hesitate to join the fun. Dawns and begins the queen stage of the rally, which will end in the mythical mountain of Timbaine, in the center of the Tunisian Grand Erg Oriental. Just take the exit we face sand dunes of remarkable size, where the Organization has placed some very difficult waypoints. The party last night has given way back to the competition and teams focus on trying to overcome the difficulties of step. Each team with its own strategy: either alone or forming alliances with pinpoint coordination: about opening and navigating, while others rescue comrades trapped in the sand. With the lights of evening we reached the magical Camp Timbaine. We were pleasantly surprised to find in the middle of nowhere this setting worthy of the Arabian Nights, sheets, showers, and a chil-out room. A delight to thank all. Begins the longest stage of the rally, It obliges us to modify strategies, because as we move forward it is more difficult to find traces of other equipment. Walking near 100 km of dunes opening ruts without seeing anyone, It is an amazing feeling, mixture of privilege and desolation. The beauty of the Grand Erg, with its spectacular dimensions and landscapes, it is marvelous to all: It is a unique desert that very few drivers dare to cross, and we are among the privileged who do. The stage is fantastic and the sand dunes final difficulties put in more than one team. By nightfall is the magnificent camp Ksar Ghilane, with thermal bath included. Pep teams Molist and Jose Antonio Guerra, They are presenting a tough battle the provisional standings leader, the French driver Benoit Landanger. Tomorrow's stage promises to be exciting! The slogan 100% sand still true from start to finish in this last stage, which it presents an added difficulty for the organization: the situation of some waypoints requires us to overcome a succession of highly technical dunes cords, which again make us rethink some strategies. A few kilometers from the finish, an unfortunate breakdown left out of the team competition Infernal Team, and in return, the team of Pep Molist, which improves positions on a regular daily, achieves victory Stage. The result of this edition 2011 is the team deserved victory Benoit Landanger, which imposed a very bold strategy from day one, a second position for Pep Molist, who has demonstrated an extraordinary level of driving and navigation dunes. Third position is for Miguel Angel Perez, example of how forward and strategy, you can be among the best. The end result at the level of human group, It is unbeatable, because despite being a competition, the fantastic atmosphere of friendship and camaraderie created among all participants, not only in moments of relaxation but also during the competition, all it surrounded by an exceptional natural environment, make all participants agree on one thing: " We will be back next year".